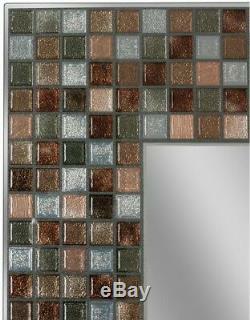 Add an artsy touch to your bathroom style with the frameless Earthtone Copper-Bronze Mosaic Tile Wall Mirror from Deco Mirror. The elegant composition features an espresso, charcoal and gray color scheme with bright copper accents. Each screen-printed tile contains transparent colors on the back, mirrored with silver to create a vibrant, reflective appearance. The effect is enhanced by a water-clear viscous ink on the surface, which adds an impressive texture relief to complete the effect. For flexible style, the mirror can be hung either vertically or horizontally. Perfect for display above a bathroom vanity. Frameless rectangular design creates clean, modern lines. Hand-crafted with espresso, charcoal and grey color scheme for an artistic addition to your bathroom decor. 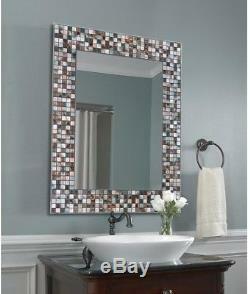 Simulated mosaic tile border adds a stylish textured touch. Versatile design enables either horizontal or vertical hanging. California residents see Prop 65 WARNINGS. Mirror orientation: Vertical / Horizontal. 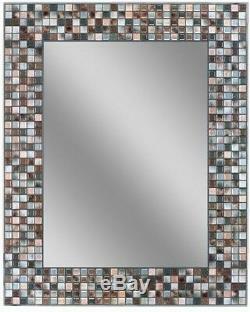 The item "24x 30 Copper-Bronze Mosaic Tile Wall Mirror Bathroom Rectangle Vanity Hanging" is in sale since Friday, September 14, 2018. This item is in the category "Home & Garden\Home Décor\Mirrors". The seller is "megadealchaser" and is located in US.